Lightly oil or spray a 10-inch (255 cm) pie plate with canola oil. In a bowl, combine the mozzarella and cheddar cheese. Spread the two cheeses evenly over the bottom of the pie plate. Spread the bacon evenly over the layer of cheese. Sprinkle the chives and the sun-dried tomatoes evenly over the bacon. Break the eggs into a 2-cup measuring cup. Beat the eggs with a whisk. Note the measurement of the beaten eggs in the measuring cup and match the egg amount with an equal amount of half and half. Whisk the eggs and cream. Pour the egg mixture over the contents in the pie plate. 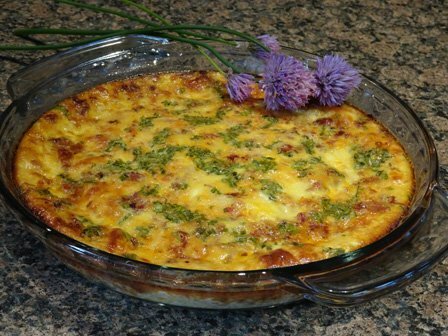 If necessary, spoon the egg mixture over any of the bacon or cheese that is not covered. Preheat the oven to 350°F (175°C). Bake for 45 minutes or until golden brown around the edges and properly set.